The Drawer Unit was designed to provide every user with the perfect custom storage space for their needs. 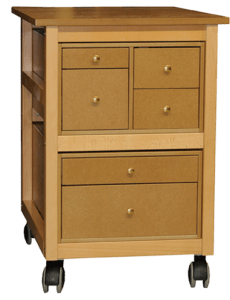 We offer 3 Unit's heights that can accommodate from 2 to 4 drawer modules, each with 2 to 8 drawers. These modules can be modulated from a choice of 12 modules (see "Drawers' modules"). Each module offers drawers of different sizes and depths allowing the unit to be assigned a particular use. The unit is available on legs or casters. This small piece of furniture is also a complement to your Studio Unit. The Drawer Unit can accommodate from 1 to 4 drawers modules selected from 12 different drawers modules. Space-saving, the unit allows you to sort, organize and store your equipment. This sturdy workbox is perfect for storing all your painting material, fine arts, sewing, embroidery, scrapbooking, pearls, etc., but it is just as good for your jewellery, your collections and much more. Mounted on casters, it moves easily to follow you wherever you like to work. The unit is also suitable for collectors. 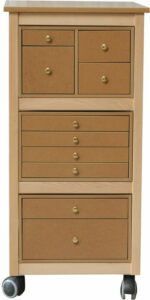 The right height, the choice of widths, we offer drawers that will adapt to the storage needs of your collections. Your equipment deserves a Drawer unit, simplify your creation with the Column! See other products "Collectionneurs / Sewing / Storage units "